BBC News Online explains the background to the BCCI banking scandal, which has led to the Bank of England being sued by creditors for £1bn ($1.8bn). Thousands of depositors lost heavily when BCCI was wound up in 1991 amid accusations of money laundering and fraud. Accountants Deloitte & Touche allege that the BoE was guilty of "misfeasance" because it let BCCI operate despite knowing it was badly run. If they succeed, the BoE could face copycat lawsuits from investors who lost money in other financial scandals. The BCCI saga still ranks as one of the biggest banking scandals of all time. BCCI went bust owing more than £10bn ($18bn) to its creditors. The bank had lost money hand-over-fist from its lending operations, its foreign currency dealings, and its deposit accounts. It was also the bank of choice for money-launderers and terrorists. Drug money from Colombia and Panama, funding for the Mujahideen in Pakistan, and Abu Nidal in the Middle East all flowed through the bank's coffers. But legitimate depositors - including many small Asian businesses - lost thousands of pounds when the bank was closed down. The losers also include 28 UK local authorities who had kept funds in BCCI. The liquidators of BCCI, accountants Deloitte Touche, have recovered billions of pounds for creditors through a series of aggressive legal actions against the bank's auditors and accountants, as well as its backers in the Middle East, such as Sheikh Zayed, the ruler of Abu Dhabi. But with only 75% of the losses recovered, they are hoping that they can force the British taxpayer to pay up for the mis-regulation of BCCI. The failure to police BCCI's activities was condemned at the time by then opposition spokesman Gordon Brown. 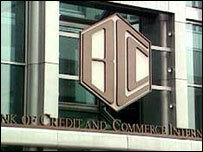 The BCCI affair is thought to have played a role in Mr Brown's decision on becoming Chancellor to remove banking supervision from the remit of the Bank of England. However, BCCI's depositors face an uphill task as the Bank of England is immune from prosecution for negligence. Instead, lawyers for Deloitte & Touche - and the 6,500 creditors they represent - are hoping to rely on an obscure legal statute known as 'misfeasance'. The law has in the past mainly been applied to corrupt election practices or wrongful arrest by the police. The lawyers for the liquidators have managed to obtain thousands of internal memos from the Bank of England's supervision division, which they say conclusively proves their case. They also argue that the Bingham inquiry, which looked into the BCCI collapse in 1992, was not told the full story. The Bank vigorously denies the claim that it acted with criminal intent, not just negligence, in failing to close down BCCI. It intends to call three former Bank of England governors, Lord Richardson, Lord Kingsdown (formerly Sir Robin Leigh-Pemberton), and Sir Edward George, to prove its case. In addition, the former heads of its banking supervision division, including Brian Quinn, now chairman of Celtic football club, will testify. The Bank claims that the liquidators are acting recklessly in bringing a court case they are unlikely to win, and have fought them for a decade to prevent the case coming to trial. The legal costs alone for the case could exceed $100m (£54m), on top of the $792m in professional fees already paid out to BCCI lawyers and liquidators. But if the government loses, it will be the Treasury and the taxpayers who will have to pay out. And victory for Deloitte & Touche could open the floodgates to litigation by other disgruntled investors. Waiting in the wings are the Railtrack shareholders, who were incensed when the government wound up the privatised company and replaced it with Network Rail. And the Equitable Life policyholders would probably like to sue the Financial Services Authority, the current regulator, to recover some of their reduced pensions. But it will be some time before a final decision in the BCCI case is reached. The opening statement alone is expected to last eight-12 weeks, with thousands of documents to be produced and displayed in Law Court 73, last used for the Hutton Inquiry. It will be after Easter before the Bank officials begin their testimony, and next year before the High Court judge hands down his decision - which could still be the subject of further appeals and haggling over the size of any settlement.